As cuneiform scribes developed a script which had been designed to write brief notes in Sumerian into one which could write long complex texts in several languages, they relied on several principles. These are not always obvious to the student today, but can make it easier to learn. One of these principles is punning. A common Sumerian word is /šu/ “hand.” Usually this is drawn as a vertical wedge and four horizontal wedges, the bottom-most longer than the others, representing the base of the hand and the fingers (Yes, hands in cuneiform have four fingers, just like hands on the Simpsons!) 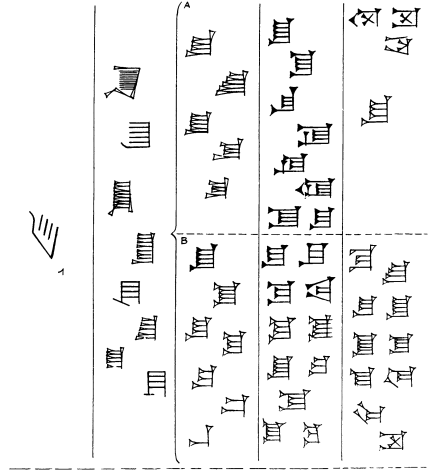 Now, having a sign for /šu/ is a very useful in Akkadian: lots of words begin with it and it is a common suffix. The Akkadian word for hand is /qātu/ (or /qātān/ “two hands”) and while it would be possible to write it as [qa-a-tu] or [qa-a-ta-an] it was convenient to just write ŠU or ŠU.II (so “hand” plus “2”). So we have one sign which can be pronounced /šu/ in one language or /qātu/ in another. That opened up the possibility of using the same sign to write /qad/ or /qat/ as part of other words, such as /qadādu/ “to bow down” or /qatû/ “to finish.” The sign had all three readings (“hand,” šu, qātu) immanent within it, and required the reader to judge which made sense in context. While the multiple readings required work to learn, they allowed the system to expand as needed without ever requiring a student to learn more than a few hundred signs. On the other hand, they opened up a world of puns which Spider Robinson would be ashamed to print (and etymologies which might have made Madame Blavatsky cry “hold on, my rubes are pretty stupid but I can’t get them to accept that one.”) For example, in the first millennium BCE Gilgameš is two thirds a god and one third human (earlier tablets give him other ancestry). These proportions do not work in the world of Mendelian genetics, where ancestry is a sum of fractions like 1/2, 1/4, 1/8, … and you can prove that no sum of such fractions equals 1/3. So why is he 2/3 divine? Now, the ferryman who takes Gilgameš across the Waters of Death once had the name Sursunabu which is neither Sumerian or Akkadian. At some point, scribes started writing his name as Ur-šanabi which is Sumerian for “the servant of two thirds.” Eventually, this became accepted as his real name, but it raised a problem: how was he a servant of two-thirds? Uršanabi was first the servant of Uta-napišti the survivor of the flood, but then served Gilgameš. And its just possible that at some point the scribes said “Uršanabi is the servant of two thirds, Uršanabi is the servant of Gilgameš, therefore Gilgameš is two thirds. What is he two-thirds? He is two-thirds divine.” We don’t know, but that kind of thinking was the way that scholarly cuneiform scribes showed off their learning. I am not a very good ṭupšarru but I have extended this principle further. 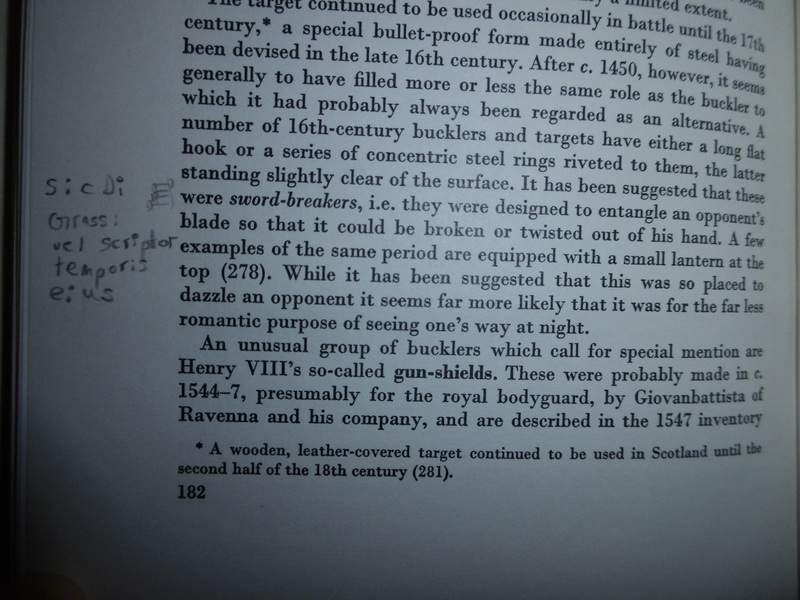 Its traditional to gloss books in the margins and to draw a hand pointing from text to gloss or vice versa. We have already established that ŠU = HAND = any word for hand. Ergo, a ŠU is a perfectly acceptable substitute for a drawing of a hand. It looks like four fingers and a thumb, to me! Thanks for the post; used to be into cuneform some years back but it has been a while. Yes, you see the ‘three fingers and a thumb’ version more when they are in a hurry or writing small. At the 2016 Security and Privacy Conference in Victoria someone made a comment about the whole issue of Records Privacy started with people making marks on clay tablets. The next day I took in the Xmas label you made to show him, and UVic Prof Colin Bennett. You used both the Roman Alphabet and Cuneiform. Epic triumph of Freedom of Public Record Information or Epic failure of the Right to Be Forgotten? We can still decipher practice writings about the pressing need for student scribes to have their parents wind and dine the instructors about giving their children the skills needed for a public service or commercial clerical job. An irony of early Greek writing is that the records were intended to be transient, ground up and reused. The earliest fragments we have from the Greeks seem to have been “ruined” by being burned into ceramic, making it impossible to reuse them.